I know there was some Guinnes in my last post, but since St. Patrick’s Day is on Saturday, I figured I might as well break out the Baileys Irish Cream too. This was my first time baking liquor into brownies and let me say that it won’t be my last. 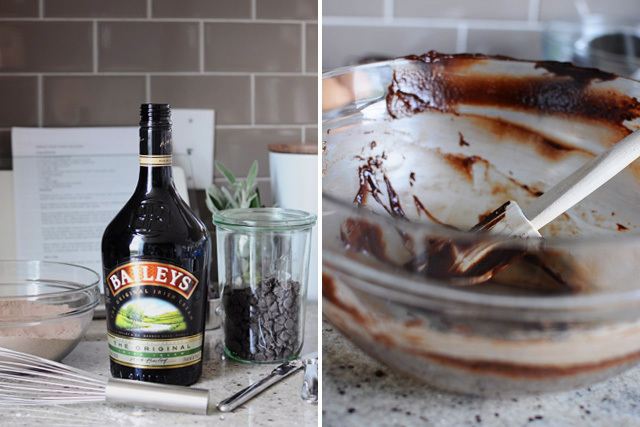 The Baileys Irish Cream is killer in these and the combination of chocolate and Baileys is absolutely heavenly. 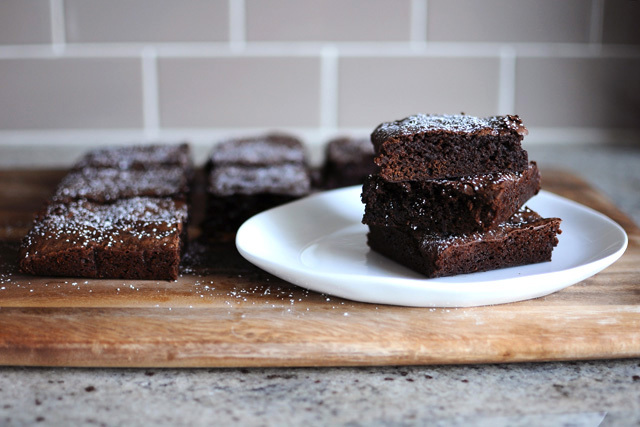 The brownies themselves are rich, dense, and fudgy… just typing about them gets me excited. So take it from me, if you like chocolate, brownies, and/or Baileys, you have to try these. Hope everyone has a fun and safe St. Patrick’s Day! Heat the oven to 350 degrees. Lightly grease an 8-inch square pan lined with aluminum foil (dull side up), and set aside. In a medium bowl, whisk together the flour, cocoa powder, instant espresso, baking soda, and salt and set aside. Place a glass bowl over simmering water to create a double boiler (making sure the bottom of the bowl doesn’t touch the water), and melt the chocolate and butter together. Take the chocolate mixture off the heat and set aside to cool for a couple of minutes. When the chocolate mixture has cooled enough so that it doesn’t cook the eggs, add the eggs to the chocolate mixture, one at a time, stirring vigorously after each addition. Then add the sugar, Baileys, and vanilla and whisk to combine. Add the reserved flour mixture and fold it in with a rubber spatula until just combined. Transfer the batter to the prepared pan and smooth out the top. Bake for about 18 to 20 minutes, until a toothpick inserted in the middle comes out with a few crumbs. Cool completely before dusting with confectioners sugar and cutting into squares (things will get messy if you attempt to cut them while they are still warm). Store them in the refrigerator and let the brownies come to room temperature before eating. Makes one 8-inch square pan or 9 good-sized brownies. 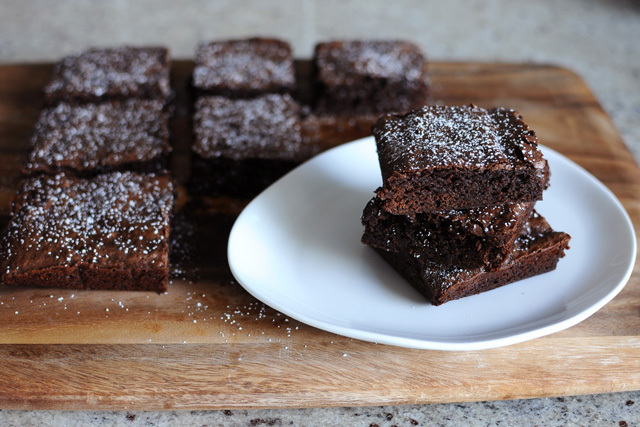 oh man do these brownies look amazing, yum!